Joe Weisenthal: I Was Wrong About the Fed. The Federal Reserve Building in Washington, DC in 2008. I’m really in favor of the practice of writers issuing mea culpas at the end of the year. It’s good for crushing one’s own ego, and it’s just good for accountability in general. I actually already wrote one for the year, wherein I changed my mind about Bitcoin from being extremely negative to being more neutral and open minded. But now I’m doing another one: I was wrong about the Fed! Specifically, I underestimated the Fed’s power to boost the economy under current conditions. For the past several years, I’ve been supportive of the Fed doing whatever it could to boost the economy, but mostly I’ve subscribed to the view of Richard Koo, the economist who has pushed the notion of a “balance sheet recession.” Koo’s view has been that in a period when the private sector was inclined to reduce debt (deleverage) that monetary policy is ineffective, and that the solution is fiscal stimulus, and more fiscal stimulus. Basically, the public sector must engage in deeper deficits in order to replenish private sector balance sheets, so that businesses and households wouldn’t have such a strong inclination to want to reduce debt. There’s a lot to be said for this view—when interest rates drop to 0 percent and people are paying down debt, fiscal stimulus must be a huge part of the mix, and monetary policy loses its effectiveness. Part of the evidence for this view is that the recent recovery has been quite weak, while fiscal policy has actually been quite tight. 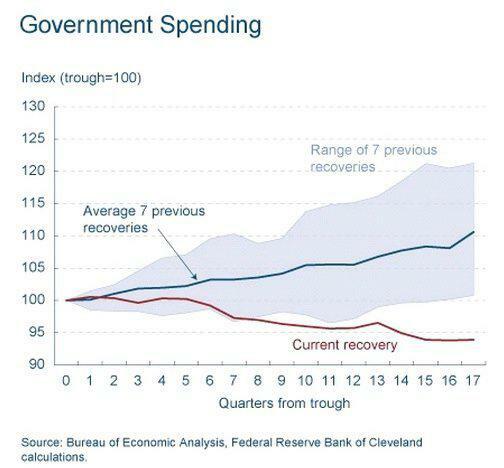 It’s really hard to dispute that tight fiscal policy and austerity has hurt the economy. But the view that fiscal policy was pretty much the only game in town was too severe. 2013 provided a nice opportunity to test whether the Fed could help the economy in the midst of fiscal retrenchment. 2013 was the year that “sequestration” kicked in—these were the spending cuts that were mandated by the debt ceiling deal of 2011. And in late 2012 into 2013, the Fed engaged in its boldest monetary stimulus yet. The Fed announced open-ended quantitative easing (previous rounds of QE were limited in size) and it also announced a type of “Evans Rule,” which stated that the Fed would not even consider raising rates until unemployment fell to at least 6.5 percent. This is actually a very elegant promise, because it means that Fed policy automatically adjusts to the changing environment. If the unemployment rate were to rise, it implies instantly looser Fed policy, since it means a longer period of time until the first rate hike. So 2013 was a great year for economic experimentation, which is something that many commentators noticed early on. In April, Mike Konczal wrote for Wonkblog on the great economic experiment of 2013: Ben Bernanke vs. austerity. As 2013 wraps up, you have to say that Bernanke did pretty well for himself. The economy is operating at its best level since the crisis. The deleveraging has come to an end, and the pace of job creation has kicked into a higher gear. Of course, one year isn’t definitive; there were already signs of the deleveraging coming to an end last year, and a lot of the austerity in 2013 was front-loaded, so the experiment wasn’t that clean to begin with. 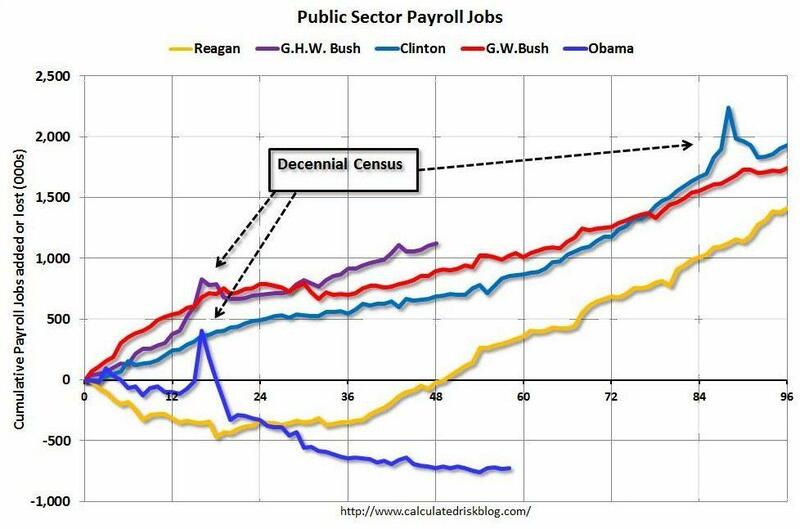 But the economy has clearly done better than I and a lot of other people would have guessed given the austerity, and it seems likely that the Fed played a role. In other words, a lot of players in the economy are paying down debt, and need cash from the government to heal their balance sheets. But some businesses are expanding, and some people are looking to move into a house, and easing credit for them makes a difference. And it’s not just in the U.S. that those who believe in the power of the central bank have done well. Japan may be turning a corner economically thanks to Abenomics, which involves aggressive monetary easing. The U.K. is turning around. And Europe’s efforts to repair its banking system have helped stem the crisis (although the Eurozone is such a disaster for so many reasons that it’s hard to pin the crash or the stability on any one thing). The bottom line, though, is that as 2013 comes to an end, I’m more monetarist than I was at the beginning of 2013. I remember one post from 2011 where I called out conservative pundit Ramesh Ponnuru and economist David Beckworth for being too confident that monetary policy could revive the economy (if done right). I still think that fiscal stimulus is an important part of the mix (or at least that the austerity we’ve seen has been disastrous), but I don’t think the Fed is as ineffective as I used to think. Correction, January 2, 2014: This post originally said Richard Koo is Japanese. He is Taiwanese-American.